Up Top Acres’ farm at Oyamel. Photo courtesy of Up Top Acres. Something’s growing atop D.C. restaurant Oyamel. Seedlings poke young leaves out of four inches of soil. 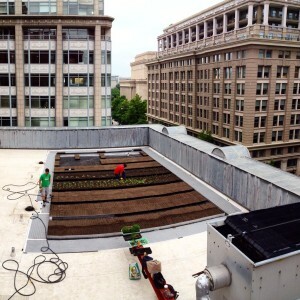 The new green roof, which opened in May, is part of Up Top Acres, a network of rooftop farms. Up Top Acres, founded by Kathleen O’Keefe, Kristof Grina and Jeffrey Prost-Greene, installs and farms green roofs around the city. They hope to partner with D.C. restaurants to offer fresh, local produce. At the same time, their green roofs provide energy savings and stormwater retention for the buildings where they are located, and the farms can be community centers for education and events. The three young founders are D.C. natives and friends from high school. They went their separate ways in college, studied urban planning, agriculture and business then came back to Washington, D.C.
What’s so great about rooftop farms? “The idea behind it was two-fold: the urban agriculture aspect, but then it’s also that D.C. has this really big issue with stormwater,” says O’Keefe. She describes how the D.C. sewer system, overburdened with runoff, dumps polluted street water into the Potomac and Anacostia Rivers. Farming roofs captures stormwater while also producing food. Plus, land in D.C. is expensive and much of the soil is contaminated, so it just “made sense to us to go to the rooftops,” says O’Keefe. At the time, Grina was working as the personal gardener of Chef José Andres, founder of ThinkFoodGroup. Andres and ThinkFoodGroup co-founder Rob Wilder’s enthusiasm for farming and support for the rooftop garden idea helped Grina, O’Keefe and Prost-Greene to get off the ground. The three friends formed Up Top Acres, took out a loan and began building. The team has now installed three roofs: the 700 square foot farm at Oyamel; a 500 square foot residential roof for private use, with extra produce going toward a small neighborhood CSA; and a 7000 square foot commercial green roof that they are retrofitting for agricultural use. While Oyamel’s thin soil is only deep enough for shallow-rooted crops like microgreens and edible flowers, the commercial roof will be strong enough to support eight inches of soil, allowing a wider variety of vegetables to grow. The biggest challenge, says O’Keefe, is that many existing buildings are not strong enough to support green roofs. The solution is to get to developers before construction begins. O’Keefe explains that planning for green roofs is mutually beneficial: building owners can rent out an otherwise unused space, and the city offers rebates for green roofs that cover almost half the cost of installation. The green roof protects the roof membrane, reduces energy bills by cooling the building, and generates stormwater retention credits, which can be traded and sold within D.C.
And with regulations going into effect this year that require new buildings to retain more stormwater, it’s a good time for green roofs. These three roofs are only the first step. “By 2020 we want to have 150,000 square feet of growing space in the city,” says O’Keefe. They plan to partner with restaurants on eight small roofs, like the one at Oyamel, growing thin-soil specialty crops. Two flagship locations of roughly 40,000 square feet each, will produce a range of crops while acting as community hubs that can host events like yoga classes, beer tastings, and school group visits.